What if something is consistent with the proposition for GOV.UK, but the GOV.UK platform can’t support it? What if there isn’t yet a content format that meets the user need? As Stephen explains, we expect GOV.UK to be able to serve these needs at some point in the future, but until then we need an alternative. Our first site went live on the new platform in February, and yesterday we migrated two more. From an end user perspective, our new engagement platform is keenly focused on meeting the user need. It’s consistent (not uniform) in design, speaks in Plain English, is mobile responsive, and meets the AA standards for accessibility. We also had the opportunity to completely change the user experience for our internal user group, by creating a much more efficient and flexible back-end. 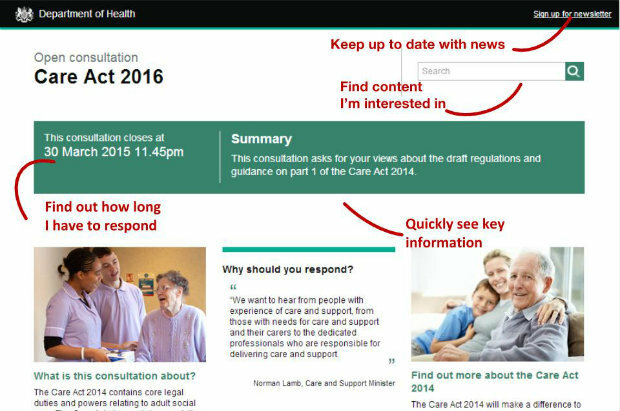 Our old multi-site HealthPress platform had hard coded, bespoke templates developed for individual policy areas or consultations. Each site had it's own domain, with different functions and site administration. The new platform is designed to be self-serve. By rationalising the content formats and making the layout flexible, we've made the process of creating sites much more efficient and less dependent on technical expertise. We've centralised the different sites under a single URL and devolved content ownership to the relevant teams. The new platform is consistent with the GOV.UK approach as far as possible. The front end has been designed using the GOV.UK front end toolkit and we're committed to continual improvement of the platform to better serve the user need. We’re running several Discovery projects to gain a deeper understanding of the user experience around Digital Campaigns and Consultations and our findings get fed back into development sprints. All of our code is open and freely available as a starting point for anyone looking to build something similar. Just like GOV.UK, our engagement platform is never going to be finished, and as with all products it will eventually reach retirement. And if our strategy holds true, if we're right that this is consistent with the GOV.UK proposition, our platform will soon become obsolete. We look forward to being part of the conversation. But what if it’s consistent with the proposition, but the platform doesn’t do it (yet)?